I am writing for a relative who took Cipro and has been unable to work for four and a half months. It was originally for a UTI but no bacteria were ever found - and a suspected tick bite complicated things. Three doses of Bactrim provoked an allergic response, so he was switched to Doxycycline for 2 weeks, then Cipro a few days later. He took a total of 8 doses of Cipro over one week, stopping for a few days in the middle because of side effects he suspected, then taking a reduced dose because he feared he would otherwise damage his kidneys with a persistent UTI (which might never have even existed). We have been through the ringer with diagnoses - from Lyme to Bactim-caused "serum sickness" to a comment that he is "out of the realm of experience" of the doctors. A rheumatologist suggested trying Tylenol and steroids to see how he would respond in order to get a true diagnosis, as all of his blood tests, with the exception of the MyLyme ImmuneID (elevated cytokines), have been normal. Thankfully he did not take these drugs as he felt too sensitive. He is doing a detox program through a local chiropracter that utilizes many rice protein-based detoxification products. He has had genetic detoxification and nutritional testing and is very low in Vitamin D, magnesium, CoQ10 and some of the B vitamins. It has helped some, but not all that much yet. The detox is no fun, but we are hopeful. Current symptoms include cartilage damage in fingertips and many joints (they were swollen and had spots originally), muscle weakness and burning, loud buzzing/ringing in the ears, insomnia, heart palpitations with night sweats, rashes, heat intolerance, fatigue and anxiety (not surprising given that who knows what you will wake up with). He is currently most troubled by the laxity of his finger joints and the swelling, and concerned about his heart even though EKG was OK - he worries about endocarditis, but no blood tests indicate it. As a person trying to help him it has been difficult. He is definitely walking better, and his mind seems clearer, but he is too fatigued and hurting to work. We have a local homeopath who is willing to work with him using homeopathic Cipro, who has worked with many children with autism-spectrum disorders successfully, but he is skeptical and fearful of this approach. I am hoping to at least find someone else who had the swollen fingertips that bend way too far and have some exudate that the doctors do not see as anything - it is a symptom that greatly concerns him. Also the cartilage damage is a big one, though we have seen some reports of that going away. His diet is now mostly organic, avoiding fluoride (some folks at SecondLook in Worcester believe that the effects are due to flouride poisoning). His diet was not great before the incident, and he was just beginning an exercise program after a year of less exercise due to a knee operation. for me as a friend/helper is to see the worry and stress this is causing him and the lack of resolution as far as diagnosis and prognosis goes. I am really looking forward to some positive stories and support and am happy to buy the book(s) if I really feel that they can offer us some help. I am the one doing the contacting because my relative is too overwhelmed - I even found a local person who is now better from Cipro toxicity who was willing to talk with him but he has yet to contact him - I think it is all too much. At any rate, thanks so much for your informative website. Thanks for doing all this for your friend. 1. NO STEROIDS! Bad bad bad for flouroquinolone sufferers. 2. Fluoride definitely plays a role, though there's much debate. 3. So you found nutritional deficiency. But I guarantee you haven't corrected those deficiencies. Detoxification is great and all, but if, say, enough of various B vitamins aren't in the body, then the body pretty much CAN'T detox. Too much toxicity isn't necessarily the problem (although it obviously is a problem), the problem is the body's A. inability to get rid of the huge level of toxicity/oxidative stress and B. the body continues to create more 'toxicity', and the body can't keep up with getting rid of it. 4. Cipro causes massive magnesium depletion. The anxiety, overwhelm, ringing in the ears, muscle weakness and fatigue, fatigue in general, heart palpitations, etc, etc etc, are all symptoms of magnesium deficiency. So yes there's a lot to deal with (pain, etc) but literally you're friends abillity to deal with stress (physical, mental, etc) is greatly impaired. So while it is 'a lot', it's more a measure that his system is unable to deal with the stress. Partly that's mental of course, but mostly it's nutritional. The mental can't operate optimally without adequate nutrition. Get the ebook. Then get on the forum Kerri and I run for Q&A, support, etc. 5. What do you mean, specifically, by 'exudate' from the fingertips? Say more about that. 6. Did he test positive for Lyme's? Or are they just guessing? 7. In all fairness, he is 'out of the experience' range of the doctors. Which says more about them, than him. Thanks so much for your reply and comments - so helpful and inspiring. I suspected that he could not really successfully detox right now. I should add that he did have mold in his house that he believes he has mostly gotten rid of, but testing has yet to be done. I know that this can add to the toxin load and make things more difficult. The exudate was clear liquid coming out of his fingertips - like they were wet and swollen but it was not due to sweating. He would wash and dry them off and they would get wet again. Hands are still swollen on and off, sometimes a joint in one finger, sometimes all of the end joints. They are also red and have visible white spots under the skin - capillaries congested? They are very weak and the joints are loose, hyperextend and swell easily. He also has had purple blisters erupt even though he cannot remember carrying anything heavy or pinching the skin at all. I have been trying to get him to soak his hands in Epsom salts for a long time. He does it intermittently, though I think he may not put enough salts in. I also suggested ice alternating with the warm Epsom salts to increase circulation. His skin is extremely sensitive and dried out too much in the Epsom salt baths. He was tested for Lyme. All Elisa and Western Blot tests were negative, but the MyLyme Immune ID test was positive for elevated cytokines causing inflammation due to Borrelia burgdorferi (the Lyme spirochete). SInce there is a disclaimer that the My Lyme test can possibly be positive for other pathogens (though it does test for the proteins specific to the Lyme spirochete), my friend is convinced it is not an issue, though Lyme is endemic to our area. Coincidentally, I had a tick embedded in my head during this saga that did test positive for Lyme at UMass. The chiropractor has worked with a lot of Lyme patients and suspects he was bitten but mounted a decent defense, though it may still be part of the picture. She is focusing on improving the milieu for all concerns. I am very concerned that the detox is not working due to the reasons you mentioned - too much toxicity to clear for a compromised body. I have already read much of the book - it is such a great resource - and hope to share the information with him and see if we can make some forward progress. Again, many thanks to you and Kerri for your work on this issue. It is quite a quagmire. Your site sends out rays of hope, and for that I am truly grateful. I gotta say, I've never heard of the leaky fingers before, that's interesting. And the purple blisters, that doesn't seem to be in the 'norm' for Cipro side effects. Curious what Kerri has to say. If it were me, I'd see a Lyme specialist. While getting him detoxed and nourished could help in the short term, 'if' he does have Lyme then all of that is just simply not going to be that helpful. I've been finding some studies that Quinolones can 'activate' dormant infections in the body and I've had more than one client who thought that they had Cipro Poisoning because the timeline for their problems started immediately after the Cipro. But they ended up testing positive for Lyme and are getting better after being treated. Especially if Lyme is endemic in your area, I'd get that seriously checked out. Lyme is VERY nasty and if he's really doing THIS horrible, I'd go see a Lyme specialist and get that thoroughly investigated. I have no insight into the exudate from the fingers. If it's clear and there are no visible breaks in the skin, it's likely to just simply be sweat? In any case, I think he's putting far too much emphasis on it, and seems to be worried about the wrong things! Anxiety from magnesium deficiency and possibly with a combination of adrenal fatigue will often do that to people, make them worry about nothing while ignoring something like the possibility of Lyme that, to me, would be FAR FAR more important to worry about. As for the purple blotches, most of us don't get enough vitamin K and VERY many alternative practitioners are recommending about 1 mg of Vitamin K2 per day for EVERYONE. Vitamin K is responsible for blood clotting, and that 'could' be the issue. He has been to a Lyme specialist who said he tested negative. My friend did go to an infectious disease specialist who said all tests were negative for Lyme. The MyLyme ImmuneID test I mentioned is a special one that only shows exposure to Lyme by detecting cytokines. It did come out as positive for recent exposure (doesn;t mean infection is active now) with inflammation caused by the Lyme spirochete. The chiropractor he is seeing, who also does functional medicine and has treated many people with Lyme, says the only thing to do right now is to improve his milieu. She feels he is simply too compromised for any antibiotics due to this Cipro reaction. It is very interesting to hear that the Cipro might have activated the Lyme. Since the western blot and Elisa came out negative - no bands at all on the western blot - maybe we need to investigate alternative testing. Or do the same test and see if things have changed. I agree that he seems to be focusing on the wrong things. We are working on the Magnesium levels - I will keep you posted on that. I am a 61-year old very healthy, active, happy, slightly overweight female who has had no health issues to deal with ever in my lifetime except chronic sinus infections. Because of a sinus infection, I took Cipro with Prednisone for 2 1/2 weeks until I finally realized that the constant weakness, pain, tightness, tingly, burning I was having in my knees, legs, and feet (which I actually remember beginning about a week into the medication) was associated with the Cipro. I immediately stopped taking it. Within days of stopping the medication, I saw my allergist/immunologist doctor who prescribed the Cipro and who I've been seeing for 10 years. He has always warned me of the side-effects of muscle weakness and pain and to stop Cipro immediately, but I never paid much attention to it because I never have had adverse reactions to any of the antibiotics I have taken over the years for chronic sinus infections. It's been 12 days since I stopped Cipro and there has been very little change. My doctor told me it would be 4 - 6 weeks before I would be back to "normal" but that I should see improvement weekly. He gave me Vicodin to take for the pain -- mostly to start my day and to help with sleep at night. But even the Vicodin doesn't seem to be that helpful and the slow, dizzy feeling is not something I am willing to put up with. It is so painful to get up out of a sitting position and walk. Bending my knees for gardening or getting on the floor to play with my 2 grandchildren are impossible to do without excruciating pain -- so I do very little of those activities. Please tell me that there will be an end to this. Is there anything I need to do to help the healing process? Do I have to stay on my feet all the time -- will that help? Should I be doing PT or massage -- would that be of benefit. I can deal with the pain and work through it if I know it will end. Yeah, I'm not a fan of Vicodin either. Unfortunately, there's nothing for me to say that's going to make you feel better, other than the 'truth' (which admittedly is always relative). If not the truth, then at least the reality and gravity of the situation. Chances are VERY low that you'll be good as new in 4-6 weeks, chances are very low that you'll see noticeable recovery from week to week. 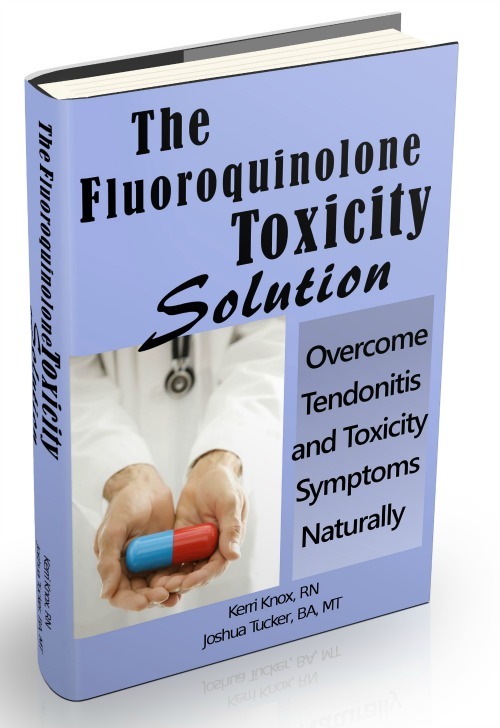 A VERY small percentage of Fluoroquinolone victims have that experience of just 'getting better'. Here's the best advice I can give you. Get The Levaquin Tendonitis Solution ebook. You MUST learn why you're having these symptoms. And you need a complete plan of attack. Cipro and Levaquin's negative impact on the human body/system is serious business. And you were given Cipro with a steroid, that's a no no, and the doctor should have known that if he'd spent ten minutes keeping himself up to date on the medications he's giving out (from a source other than the pharmaceutical company that markets to the hospital/doctor and sells him/his hospital the drugs they use). The doctor you like had no business telling you you'll notice marked improvement from week to week. I'm all for positive thinking and good words on the brain, but the time for that is before or with treatment, not after you've been hit with cytotoxic side effects. It was wishful thinking on his part and not based on the experiences of huge numbers of people with Cipro side effects. Having said all that, what I've said may occur as a downer, or frightening. I DO want to shock you a little, so that you will get that Cipro side effects are BAD NEWS and must be taken seriously, not waved off with a 'oh, you'll get better, here's a pain pill till that magically happens'. The good news is, you're not necessarily doomed, but you DO have to (well, ya know, you don't have to but I would were I you) get to work right now to correct the situation. So back to the ebook. Speaking in a straightforward way, if you want to get better you MUST take effective measures to help your body come back towards health and healthy operation. It's possible that your body will do it on it's own, but from what you've described, I wouldn't put money on it. Hopefully with what you'll find and get to working with in the ebook, you'll notice a significant decrease in symptoms in a relatively short time, and then it's predictable that there will be a level of side effects that will take more time. How much time is anybody's guess. Every body and every body chemistry is different. And it's safe to say you were experiencing a certain lack of systemic health before the Cipro. But the basics of how the body works, and how Cipro works, don't change. In summary, you're hurting for a set of reasons. You can reverse some/most of those reasons, and that will give your body a chance to recover. I recommend the ebook, because some tips just aren't going to help. Cipro causes side effects due to a complex mechanism, and you need to understand it to be able to heal it. With the ebook comes the Levaquin Tendonitis Forum, where Kerri and I answer questions, fine tune what you're doing, give you personal attention, etc. Because of cipro I can't work as a fireman anymore. My name is Christopher J. I am a 30 year old male living in southern California. I consider myself in excellent health. I am a firefighter paramedic who works out almost every day and live an active lifestyle. I’ve never had any medical problems. I’ve also never had any significant pain or injury to my legs. • After 2 weeks on Cipro, my symptoms had not gone away. I informed my primary care doctor that I was having soreness in legs, mainly my hamstrings. He stated that this was not from the Cipro and to continue taking it. • I also saw a urologist who advised me to stay on the Cipro. I took the medication for 3.5 weeks (51 pills). My urologist performed a cystoscopy on me and determined that I had a urethral stricture and that is what was causing my symptoms. DID NOT EVEN NEED THE CIPRO! • I was prescribed the medication for 4 weeks, but stopped at 3.5 weeks because during a walk I noticed I had a decent amount of pain in my legs (hamstrings and behind the knees). • During the course of the medication I did not exercise and tried to rest my body as much as possible. We've talked by email and I believe you're on the private forum now, but I'm adding this here since A. you submitted it and B. now other people can find and learn from your experience. On Cipro for 30 day, 2x per day 500mg for POSSIBLE PROSTATE INFECTION causing frequent urination. Doc said he took it and cleared his situation. After completing the 30 day supply, and going on a 3 day ski trip at the end of treatment, I had no issues. I suddenly got foot pain that seemed like tendons. That stopped after a week of treatment and 2 days later got what I thought was MCL strain, on inside of leg. Knee pain has continued to get worse over last 1.5 months, to where it is hard to walk especially after sitting. Went to Sports Doc, he tested for any type of knee damage, took Xrays, all clear. Diagnosed me with hamstring tendinitis. Went online and found all this bad info on Cipro. I have made some progress this week with NSAIDS, Stretching, Cold/Hot therapy. Did the doctor test to see if the potential prostate issue was bacterial or fungal?